Bjørn Lomborg is articulate, attractive, youthful-looking and the supposed voice of reason in the debate over environmental policy. So, it is no surprise that he is making the rounds in the media this Earth Day season. In a piece in USA Today he recycles claims from previous work that "many key environmental measures" are getting better. As you sift through the piece, you will see that his "key environmental measures" relate almost exclusively to the health and well-being of humans. And, this is what he uses to build a three-fold strategy to deceive the public. First, he equates human well-being with the well-being of the planet as a whole largely ignoring declines in the functioning of the very ecosystems that support human life. Second, he knows that humans are particularly eager to hear good news about themselves, especially when it is wrapped in rhetoric that makes it appear that we are not undermining our environmental support systems. Third, he accuses those who call for blanket curtailment of practices such as the burning of fossil fuels of having no concern for the poor. Let's take each strategy in turn. Human well-being is the same as planetary well-being. It is easy for people to think that general conditions on Earth are getting better if those people are well-fed and have access to adequate housing, education, economic opportunity, and recreation. If a person has been alive long enough, he or she will probably notice that many waterways are cleaner than they were a generation ago and that the air in many cities is now clearer than it used to be. Lomborg is playing on the tendency of humans to judge conditions on the planet based on their own personal experience and to assume that this experience is the best indicator of those conditions. Of course, major planetary systems such as the oceans, the forests, the soil and the climate are moving in dramatic and measurable ways that are hostile not only to human survival, but also to the survival of virtually every other living thing. But these changes are not readily apparent to the average urban dweller who neither experiences them directly nor has the apparatus or training to measure changes in such systems. What humans have actually been doing is overtaxing the Earth's ecosystems and that makes them feel, well, great--at least for a while. Humans have had such spectacular success at increasing their numbers, longevity, health and overall material wealth that it is hard for them to surmise that something is wrong. But our trajectory as a species is the very picture of overshoot. And, we have become ever more confident in our path even as the carrying capacity deficit builds. Ecologically speaking, what characterizes population trajectories such as ours is a steep and seemingly unstoppable rise followed by a rapid crash as the carrying capacity deficit exceeds critical levels. In other words, everything is all right until it isn't! That's why measures of human well-being are not very useful in judging the health of ecosystems. Humans are particularly eager to hear good news about themselves. Think back to when you were a child and received praise from your parents or from teachers about your grades; your performance in a school concert or play; your prowess on the football, basketball, soccer, or other field of play; or just about anything that you did well and in accordance with the wishes of your parents and teachers. Who doesn't want to be praised? Well, Lomborg is full of praise for what we've supposedly already done to "improve" the environment. He doesn't claim there is no work yet to be done. But in a week filled with dire warnings about environmental catastrophe, Lomborg's message is designed to stand out. It's an excellent public relations ploy. Those insisting on drastic policy shifts have no concern for the poor. This is an especially pernicious claim by Lomborg. It makes people who advocate swift and thoroughgoing changes in environmental policy out to be monsters. What Lomborg doesn't want readers to think about is how the existing system is responsible for creating the huge disparities in income and therefore the degraded and perilous conditions of the world's poor. He acts as if the very system that enslaved the world's poor will be the one that somehow alleviates their condition. It is all too easy for privileged Westerners to convince themselves that they have done a great service for the world's formerly preindustrial cultures by colonizing them and then forcing them into the industrial model. That said, Lomborg is correct on one point. It is hypocritical for those living in wealthy countries to insist that the world's poor forego the benefits of a Western lifestyle in order to "save the planet" if these same wealthy countries are unwilling to make drastic changes themselves. But that doesn't mean that drastic and rapid changes aren't necessary across the board to prevent the collapse alluded to above. Essentially, Lomborg's argument is that the world's poor need to be lifted out of poverty by continuing business-as-usual, only more equitably practiced. This argument allows those of us in wealthy countries an excuse for continuing on our current trajectory even if we are supposed to do it using green technology. Whether Lomborg is cynical or merely blind to his own subterfuges, I cannot know. But his clever rhetoric has kept him in the spotlight year after year. Maybe that's all it was intended to do. Talk with many green technology advocates and you might get the impression that we have forever and a day to make the transition from an unsustainable society to a sustainable one. Of course, they will tell you that one day far into the future, if we don't make the transition, we will have serious problems. Their view is based on not one, but two assumptions. First, as I said, it is based on the notion that we have a comparatively long time to make this transition, usually claimed to be several decades. Second, it is assumed that technology will appear and be deployed in time to prevent the worst problems that might result from fossil fuel depletion, climate change and a variety of other environmental and resource challenges. In short the transition will be a relatively smooth one. Keep in mind that these are people who believe we have serious problems that need to be addressed. Their agenda as environmental matters go is actually quite radical if somewhat gradualist. The notion that we have a comparatively long time stems from two lines of thought: 1) The idea that the problems we face aren't that serious yet and 2) the belief that supplies of fossil fuels will be adequate until we are able to address these problems by developing and deploying alternative energy along with other technologies to address climate change, soil degradation, deforestation, fisheries depletion, fresh water depletion, and so on. Of course, the technological optimism stems from two centuries of unparalleled technical achievement. My usual response to this is that technology is NOT energy, but rather runs on energy. Ergo, if you don't solve the energy problem, you won't get the technical fixes you are expecting for two reasons. First, you need sufficient energy to support a gargantuan research and development infrastructure to invent and test possible technical solutions. Second, you need energy to run that technology once you deploy it. Think of the amount of energy we would require for atmospheric carbon dioxide collectors on the scale needed to actually reduce carbon dioxide levels even if we seriously curtail emissions. And, finally, the perverse or counterproductive effects of new technology are never considered. All the technologies which are going to be deployed are somehow assumed to have zero side effects. Let us return to the urgency issue. It is notable that some green technology optimists give themselves decades for a successful transition. Clearly they are hoping they are right for a very important reason: Substituting one technology for another or a new resource for a dwindling one requires time, often considerable time. It could easily take decades to replace our current liquid fuel-based transportation infrastructure with one that relies primarily on electricity. If our rate of conversion is too slow and the time window for the conversion too short, then we will fail. The most critical question is how much time we have to make the transition. A fully equipped hospital with on-duty surgeons and staff may be the ideal technology for a critically injured patient. But they mean little to such a patient if we are in the position of having to build the hospital and train the surgeons and staff before administering treatment. I think this analogy aptly describes our current predicament. If you miscalculate concerning the time question, it will not matter how clever human beings are. This concern is at the heart of the peak oil movement. Its most coherent statement is the now famous (at least within peak oil circles) Hirsch Report published in 2005. The report suggests that a 20-year crash program to develop and deploy alternative liquid fuels before the peak would be necessary to prevent tremendous social and economic dislocations. Hirsch is even less sanguine now given the torpor among the world's leaders on this issue. Partly this stems from his belief that peak will arrive within the next five years. The green optimists need to rethink their position and do a little scenario planning. What if they're wrong about how much time we have? What is their fallback strategy? Even if they regard the risk of a nearby oil peak as small, they cannot absolutely know when peak will occur. Given that their entire approach is balanced on one assumption, namely, that we have decades, they must, of necessity, admit that a nearby oil peak would call for an entirely different approach. That approach would require immediate and drastic action to reduce our consumption of oil and to move our infrastructure quickly toward other forms of energy that do not deplete. It might also require some stopgap measures using nonrenewable resources such as coal and natural gas, but only to help us complete the transition. Will the post-oil future be bicycle-free? U. S. Secretary of Transportation Ray LaHood may soon be nominated for heresy-of-the-year award for an impromptu speech at the 2010 National Bike Summit last month. In that speech he said federal transportation policy will no longer favor automobiles over bicyclists and walkers. As anyone who regularly rides a bicycle knows, this change is big precisely because automobiles and bicycles share much of the same infrastructure. But this very fact may bode ill for the bicycle in a post-oil future. This distressing line of thought occurred to me recently as I was finishing James Howard Kunstler's beautifully written post-oil novel, A World Made by Hand. I spotted not a single bicycle in its 317 pages. Why? Because in the novel the roads upon which one might ride are crumbling beyond passable. These roads are navigable on foot or by horse, but not particularly by anything on wheels. But, wait, you may say, bicycles don't need good roads! We'll use trail bikes instead. All well and good. Still, where will the rubber for the tires come from? What we use now is synthetic rubber made from oil. Perhaps we'll get latex from such places as Brazil and Malaysia, that is, unless world trade has broken down. And, the way in which bicycles are made today, we'll need aluminum smelting operations for all the aluminum parts, even if only for repairs. As simple as a bicycle is compared to a car, there is much that ties it to the energy-intensive, global logistics chain. No doubt we could make bicycle frames out of something other than aluminum. But again, we must ultimately come back to the question of right-of-way. If we assume that there will not be sufficient resources to run a nationwide fleet of private automobiles and therefore neither the political will nor the financial capability to pay for the upkeep of our road system, then we must also assume that the bicycle as a widespread form of transportation will not be practical. Some locales may maintain a few bike trails. But it is hard to see highways being maintained just so bicycles can ride on them. Let's go back a bit in history to understand why. Bicycles came of age in the latter half of the 19th century. As such they were manufactured on the industrial model. Bicycle owners became a potent force for the paving of roads upon which they could then ride. Ironically, the industrial methods for the manufacture of bicycles and the paved roads which bicycle owners championed became the basis for mass-produced automobiles--automobiles which ultimately usurped the roads from bicycles. Now, my apprehension about the future of the bicycle posits that industrial society has sunk into a pretty sorry state and that no forms of motorized land transport for which it is worth maintaining roads survive . But even if we maintain main roads for, say, intercity buses, that would still leave all the side roads--roads ideal for bicycle riding--without maintenance. I'm ashamed to say that until reading Kunstler's novel it had never occurred to me just how dependent my bicycle is on the automotive infrastructure. Could it be true that the bicycle's viability is linked to that of the automobile? Having said all this, I'm hoping someone will talk me down and explain how we might be able to have a future filled with bicycling no matter what the fate of the automobile. It took a French newspaper to unearth information put out by the U. S. government more than one year ago that provides a worrisome projection for world oil supplies from an agency that for years said such supplies would be no problem for the foreseeable future. 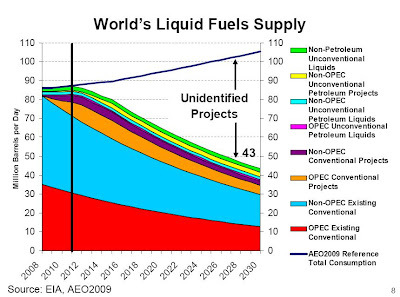 Glen Sweetnam of the U. S. Energy Information Administration acknowledged in an interview that total liquid fuel supplies could actually fall between 2011 and 2015 "if the investment [in new capacity] is not there." 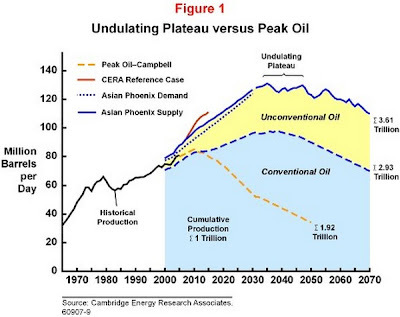 While this report has been circulating on peak oil sites in the last week, it is a graph which accompanied Sweetnam's 2009 presentation (PDF) which I found particularly illustrative. (See below.) It reveals in stark relief the dangers of running the world using the ideas of what I call faith-based economics. Let me back up for moment. I use the term faith-based economics to refer to the pathology we currently call neoclassical economics. The Encyclopedia of Earth does a very nice job of explaining the origins of neoclassical economics and why it is complete nonsense to rank it among the sciences. So if it is not science, then what shall we call it? I suggest that it is a religion because its basic precepts are not subject to verification; and so, like a religion the tenets must simply be taken on faith. This wouldn't be so serious were it not for the fact that neoclassical economics as a system of thinking dominates policymaking and academic thought across the globe. And, it parades as a science that can help us determine optimal economic policies. In 2007 the neoclassically inclined thinkers at the U. S. Federal Reserve forecast that the world might experience a slowdown in growth and said that the subprime loan problem was well-contained. Readers will recall that in order for something to be a science, it must be able to make accurate, verifiable predictions. We can verify that assurances of a limited credit problem and a soft landing were dead wrong. And, it's not clear, in my view, that anyone can consistently make accurate predictions about the direction of anything so complicated as the world economy--lucky guesses, yes, but consistently accurate predictions, no. It is an often rehearsed claim among neoclassical economists that market forces will allow society to extract whatever it needs from the biosphere. The EIA was once explicit in its concurrence with this view. In its 1998 Annual Energy Outlook (PDF) it details a series of adjustments to its forecast for oil supply and then explains: "These adjustments to the USGS and MMS estimates are based on nontechnical considerations that support domestic supply growth to the levels necessary to meet projected demand levels." Here's the translation: The projected supply growth was fudged to meet projected demand growth. The magic of the marketplace is supposed to make resources we don't know about or cannot currently extract appear. Now, let's look at a graph from a 2006 release from Cambridge Energy Research Associates (CERA), the archcornucopians of the energy consulting business. The impression the graph gives to the uninformed observer is that we--that means some humans somewhere on this planet--know exactly where all the oil supply depicted will come from. The truth is more unsettling. Much of what is included in this graph has not yet been discovered or has no demonstrated technology which can extract or produce it economically. Now to the graph that so aptly demonstrates the gulf between what neoclassically inclined thinkers (like those at CERA) tell us and what we actually know. 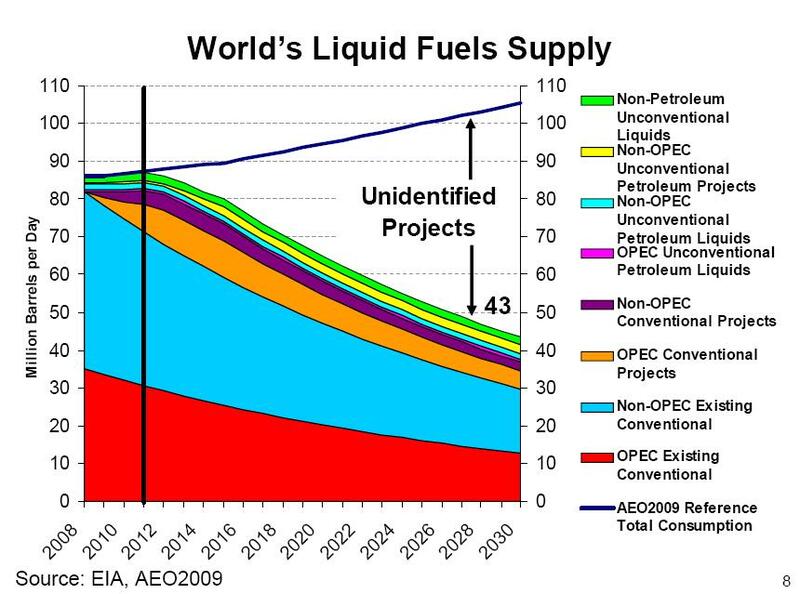 Sweetnam's graph shows us what EIA currently recognizes as known sources of oil that we have the technology to extract. It then shows us the gap between that and what we think we will need. It rather charitably calls this gap "unidentified projects." I would call these faith-based projects. I have no doubt the oil industry will identify new projects in the future and successfully develop many of them. What I have less faith in is that these "unidentified" projects will be sufficient not only to overcome the relentless depletion of existing wells, but also to cause a substantial increase in the rate of production. Sweetnam's graph--the first of its kind from EIA--shows us exactly how much faith it takes to practice faith-based economics. To be a true believer one has to wager the entire future of our oil-dependent civilization.